The playoffs are here and we should all be soaking up every minute of that. However, there are 14 unlucky franchises that are missing out on the fun and already looking forward to next year. With them (and their fans) in mind, this series will take a look ahead and help lay out the priorities for this offseason. The Suns will continue to fit pieces around Devin Booker. Thank god for Devin Booker. After scooping Booker up with the #13 pick, the Suns found themselves a steal. They found themselves an identity. They found a star build around. While all those ugly losses pile up, they found something to root for — including Booker’s 70 point game this season. How many times can you remember a 24-win team earning national headlines like that? 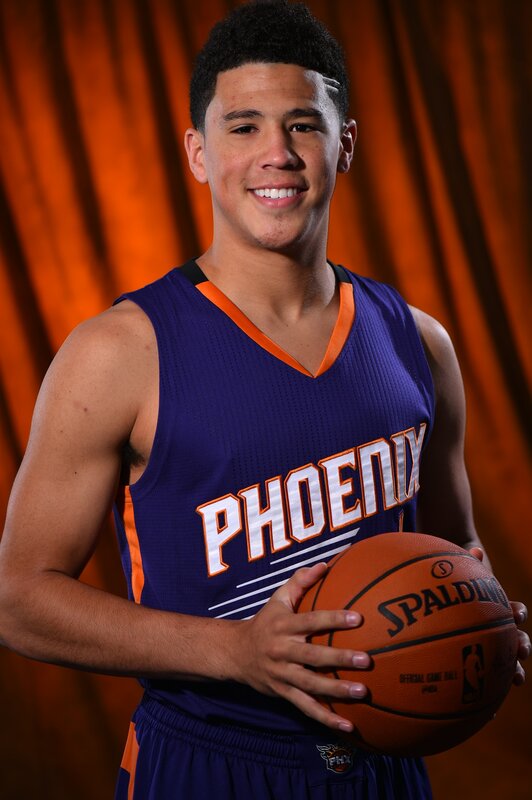 Booker’s brilliance also covers up what amounts to a deep, deep rebuild in Phoenix. Young bigs Marquise Chriss and Dragan Bender are a long way away, and even Booker (seen as a good defender in college) can look lost on that end of the floor. The Suns will have a BIG question mark hanging over their offseason (a seven-foot question mark, to be precise) in the form of center Alex Len, an impending restricted free agent. Still only 23, Len can be viewed through an optimistic lens. He has some skills, and he’s a solid positional defender. Given his age, you can make the argument that he’ll be entering his prime on his next contract (which should run until he’s about 27 or 28). Personally, I’m a little more a “glass is half empty” on Len. He’s more of a traditional center in an era that doesn’t value those attributes as much. I also wonder what his exact upside would be. Someone like Jonas Valunciunas perhaps? Unfortunately, Len isn’t nearly as skilled or efficient of a scorer as Valunciunas is (which explains Len’s -3.62 on offense in terms of real +/-). And it’s not like Valunciunas is much older, either — he’s only 24. If the Suns can retain Len on a cheap contract — or maybe on a one year deal to allow him to join unrestricted free agency — then it makes sense. If it would cost $10+ million a year on a long-term deal, I don’t see that as a particularly prudent investment. It would limit the Suns’ flexibility, both on and off the court. While the jury is still out on Alex Len, they’ve come back with a unanimous verdict on guard Brandon Knight: he’s not good. You’d think Knight has the skill set to be a good combo guard off the bench, but he hasn’t performed well in that role either. Analytics consistently rank as one of the worst rotation players in the league, year after year. Worse yet, he’s on a long-term deal. The money isn’t horrible (around $14 a year) but the fact that there are three more guaranteed years makes it tough to stomach. It’s not a matter of should the Suns trade Knight, but whether they can. They wouldn’t get value back, so it’d be a straight up salary dump. Perhaps a team like Philadelphia or Sacramento (both light in terms of guards) would view Knight as a decent minutes-eater and would take him off the Suns’ hands. If not, it may be wise just to bury him at the end of the bench, and roll with Eric Bledsoe at the point and Tyler Ulis as the primary backup. The Suns will enter the offseason with cap room, but they’re not at the stage of their rebuild that requires a big splash. Any free agent they target should be under 25 years old. There are a couple of wings who fit that mold in Tony Snell and Andre Roberson. They’re both 25, and excel on perimeter defense, which the team desperately needs. However, even after all of Roberson’s FT bricks, both should command sizable contract offers. Overpaying for one may make sense if the Suns were closer to playoff contention, but given that they’re still 2-3 years away from that, I’d shy away from $10+ million contracts that they’ll command. Instead, I’d go bargain shopping. The team already has some solid veteran leaders like Tyson Chandler and Jared Dudley, so they would be wise to fill the bench with “upside” plays. Those young developmental projects don’t have to be expensive, either. I’d eye former Kentucky standout turned Celtics washout James Young (still only 21), Warriors bench James McAdoo (24), and even the nomadic and enigmatic Terrence Jones (25). I believe the team should also lock up their own 24-year-old Alan Williams as well, with an eye on his upside. Chances are, taking fliers on guys like this won’t pan out, but it’s worth the risk/reward. The Suns can’t afford to take any chances in this draft, where they’re currently projected to hold the #2 spot. But in actuality, it’s unlikely that they’ll keep the 2nd pick. They’re at a position in the draft with a lot of movement and volatility. According to draft odds, there’s a 19.9% chance they end up with #1, 18.8% they stay at #2, 17.1% chance they slip to #3, 31.9% (!) chance they end up at #4, and 12.3% chance they fall all the way to #5, which is the lowest that they can go. No matter where they land in the top 5, I’d encourage them to take a good hard look at Kansas SF Josh Jackson. Washington’s Markelle Fultz may be the consensus #1 pick, but I actually believe Jackson ranks right up there with him as an elite talent. Jackson didn’t put up the amazing raw stats that Fultz did, but that was partly because he joined a team with two veteran college guards in Frank Mason (a senior, and subsequent player of the year) and Devonte Graham (a junior). He wasn’t handed the keys to the offense on his own; he had to fit in and excel in all facets of the game. Jackson’s shooting form is a little slow and off-rhythm, which should concern you some. But other than that — he has it all as an NBA player. He’s quick-twitch explosive, with springs in his shoes. In that way, he reminds you of fellow Jayhawk Andrew Wiggins. However, in my mind, Jackson has more passing skills and more of a killer instinct than Wiggins does. He excels as a defender and revs up the intensity as needed. He had some off-the-court problems, but coaches rave about his team leadership and basketball IQ. Simply put, Jackson is the IDEAL pairing with current Suns’ star Devin Booker. Jackson may not be a good shooter right now — but Devin Booker is. Devin Booker may not be a good defender right now — but Jackson is. Every weakness they have is made up by the other, which is why I consider them the perfect “yin and yang” pairing. If the Suns end up at #1 or #2, they can debate Markelle Fultz or Lonzo Ball as well, but that would lead to some shuffling throughout the rest of the roster. There’s no guarantee the team can get a fair trade value for Eric Bledsoe. Personally, it feels like a cleaner fit to slide Jackson into the lineup instead. T.J. Warren can move to the bench, where his own instant offense (and questionable defense) would be better suited. It’s a win-win all around the roster.